Black coal miners date back to slavery. 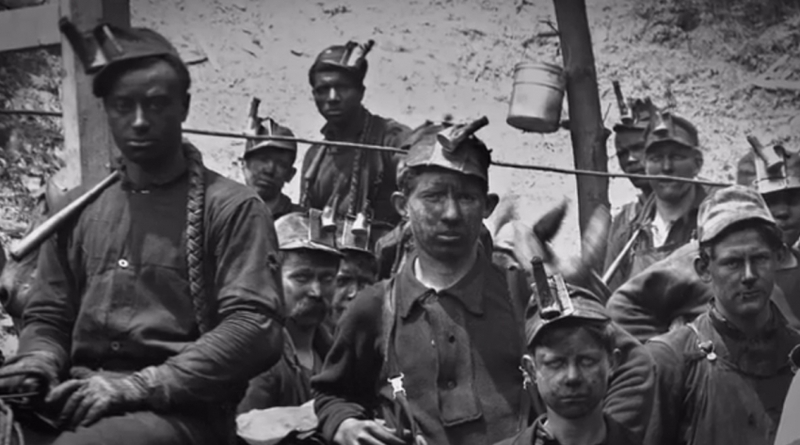 The first Unions formed in West Virginia included black coal miners. Today a coal miner makes about $85,000 a year. That is good money – especially in he mountain regions of West Virginia. Coal is dying though as an industry due to pollution. In 1863 West Virginia separated from Virginia. West Virginia placed a greater emphasis on funding white schools than it did black schools. The African- American community took it upon itself to create the first schools in the state for blacks. In 1862, a year before the state’s creation, a black school was opened in Parkersburg. In 1866, the state agreed to take over the Sumner School, making it the first publicly financed black school in the entire South. Black schools sprang up in other towns, including Charleston, Clarksburg, Fairmont, Grafton, Keyser, Lewisburg, Malden, Martinsburg, Morgantown, Piedmont, Point Pleasant, Ronceverte, Shepherdstown, Union, Weston, Wheeling, and White Sulphur Springs. There was a growing need for individuals to teach the increasing number of black students. Storer College, established at Harpers Ferry in 1867, was comprised of two components, a grammar school and a normal school for the training of teachers. In the 1890s, the state created two additional black normal schools, West Virginia Colored Institute (later West Virginia State College) and Bluefield Colored Institute (later Bluefield State College). Coal was King, and it was mined as far South as Alabama. From 1880 to 1904, 10 percent of Alabama’s state budget was paid by leasing (mostly black) prisoners to coal companies. As a history tidbit – The original “Mother Jones” was a Union organizer at the Pocahontas Mine in Tazwell, Va. She would help organize coal fields in West Virginia in the Kanawha Valley. Mary Harris “Mother” Jones, led striking miners. Jones, a native of Ireland, was already a major force in the American labor movement before first coming to West Virginia during the 1897 strikes. Although she reported the year of her birth as 1830, recent research indicates she was probably born in 1845. As a leader of the UMWA’s efforts to organize the state, Jones became known for her fiery (and often obscene) verbal attacks on coal operators and politicians. Among the elected delegates to the founding UMWA convention were at least five African American miners. By 1900 approximately 20,000 black miners had joined the union, representing about 20% of UMWA membership. One of the best known African-American UMWA members was Richard L. Davis, who mined coal in West Virginia and Ohio. A delegate to the founding convention in 1890, Davis later served as a UMWA organizer in Alabama, Ohio and West Virginia, and was twice elected to the UMWA National Executive Board. This is drift mining with a continuous mining machine. Notice the cut is only 3-4 feet tall, and the tunnel is not tall enough to stand in. Coal was booming, and work was plentiful. By the 1930s, the industry employed 400,000 miners, 55,000 of whom were black. African Americans were restricted to more physically demanding positions requiring less skill, earning30 percent less than whites. But their wages were still high by national standards: $118.30 per month, according to one 1929 survey. By contrast, a national study in 1939 later found that black men earned an average income of $460 per year. Verizon – The Straw That Broke the Camel’s Back? Well… The strike at Verizon may have finally lit the fuse. Verizon called in hundreds of non-union employees and additional management to fill in for striking workers as the work stoppage by unions enters its tenth day. The company said the replacements are handling customer service and network operational duties. “We’ve called up hundreds of additional employees in the last few days,” said Verizon spokesman Rich Young. Meanwhile, the Communication Workers of America union said that more than 100,000 people have signed a petition asking the company’s chief executive to start serious negotiations with strikers. Much of the impasse between Verizon and unions, including the International Brotherhood of Electrical Workers, centers on $1 billion in concessions that the strikers claim the company is demanding from them. Union officials, who say they don’t want to lose their members’ free health care benefits, assert that since Verizon is a very profitable company (and has paid in excess of $258 million over the past four years to five top executives); the workers shouldn’t be forced to make such sacrifices. “We will never have an economic recovery if profitable companies like Verizon can demand huge concessions from workers,” said CWA Communications Director Candice Johnson. Things are just getting revved up… This is a good start to the recall effort to take down the criminal Republican legislators in the state. Tens of thousands of protesters marched around Wisconsin’s Capitol on Saturday while hundreds more gathered in the building’s rotunda as part of a planned daylong demonstration against a new Republican-sponsored law that drastically weakens the state’s public employee unions. Opponents of the legislation that strips most public employees of nearly all their collective bargaining rights say the fight is not over even though Gov. Scott Walker signed it into law on Friday. “I’m here because I think it’s important that not only the governor but other people need to understand that this is not simply a union issue,” said Bridget Stafford, 43, a teacher and union member from Stevens Point, Wis., who was watching other protesters from a balcony in the Capitol. “It’s about people’s rights.”Stafford she was especially angry over the legislation because she felt Walker didn’t propose it during his campaign. “He’s been lying from the get-go,” she said. The cold, breezy day started quietly, with a few dozen people gathered in clusters outside the Capitol. Groups of police officers also huddled outside the building. As the morning went on, however, more people streamed toward the Capitol. By late morning, tens of thousands of protesters were marching around the Capitol, cheering as dozens of farmers driving tractors joined in the procession. Chants of “This is what democracy looked like!” echoed off the buildings surrounding the Capitol’s square. M&I Bank’s branch on the Capitol Square, at 1 W. Main St., closed Thursday after demonstrators, protesting campaign contributions by bank executives to Gov. Scott Walker, gathered outside the bank and several pulled their money out. Madison police said hundreds of people had gathered at the front entrance to the bank. “(The) concern was if the crowd continued to grow, it would be difficult for us to guarantee access and safety for those trying to get in and out of the bank,” police spokesman Joel DeSpain said. He said police did not tell M&I officials to close the bank. Members of several labor unions stopped at M&I twice between 9 and 9:30 a.m., said Joe Conway, Jr., president of Local 311 of the International Association of Fire Fighters. The protest was peaceful, he said. Several protesters went inside and closed their accounts, displaying checks that totaled $192,000 withdrawn, Conway said. Schmitz declined to comment about any withdrawals. Georgia-Pacific LLC, based in Atlanta, and its subsidiaries, have approximately 300 manufacturing facilities across North America, South America and Europe, ranging from large pulp, paper and tissue operations to gypsum plants, box plants and building products operations, and more than 40,000 employees worldwide. Georgia-Pacific’s familiar consumer brands in North America include Quilted Northern®, Angel Soft®,Brawny®, Sparkle® , Soft ‘n Gentle®, Mardi Gras®,Vanity Fair®, and the Dixie® brand of tabletop products. Consumer brands include STAINMASTER®carpet, ANTRON® carpet fiber, CORDURA®fabric, and COMFOREL® fiberfill.